There's no need to understand database structures, joins, the SQL language... Stonefield Query has you covered with its built-in knowledge of your database. 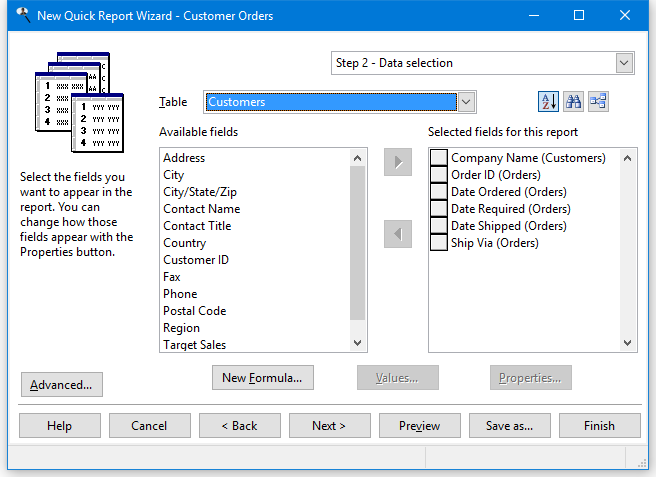 Simply pick the fields you want and Stonefield Query figures out how to give you the results you need. You don't have to tell it how to get the data from the database like you do with other reporting tools. It shows descriptive names for all fields and tables rather than cryptic names and symbols. It displays descriptive operators such as "equals" and "greater than" instead of "=" and ">." Stonefield Query takes care of joins between the tables automatically so you don't even have to know what a join is. There's special handling of certain fields: it displays a description rather than a meaningless lookup ID.